Last night I set myself an engineering challenge. 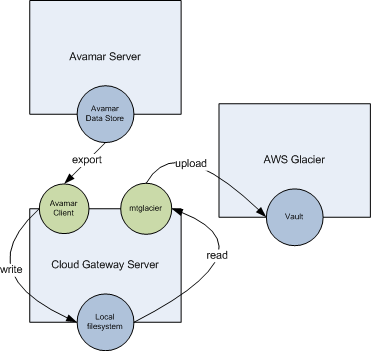 Is it possible to archive Avamar backups to AWS Glacier? This is being shared in the spirit of experimentation. OK so first let me describe what is required. We need a host to act as our Avamar to Glacier gateway. This is analogous to a Cloud Gateway. For this I am going to spin up a Linux virtual machine running CentOS. Next we need a way to extract backups from Avamar into a flat file. It turns out the Avamar Extended Retention feature introduced a method to export and import Avamar backups to/from PAX streams. In this case we are going to turn the backup stream into a flat file and use that as the basis for archiving to Glacier. We also need a way of shipping these flat file backup archives to Glacier. There are a few options available. I am going to use mtglacier. This tool allows a local file system to be kept in sync with one or more Glacier vault’s. In our case we do not want to keep the files around so once they have been uploaded they will be deleted. We have our Avamar server (in this case Avamar Virtual Edition running 7.0SP1) with an Avamar Data Store (file system). 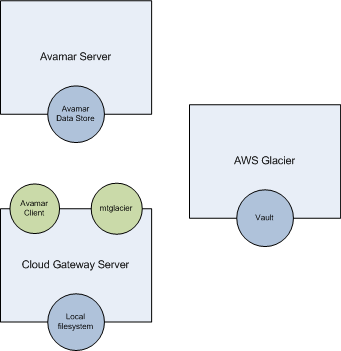 We have our Cloud Gateway Server with Avamar client and mtglacier installed and we have Glacier supporting the vault. I am not going to discuss the process of installing Avamar client or mtglacier. These are already well documented. For this experiment I created a small backup that is 176588 KB in size from a Windows client with the name winco.mlab.local. This client is registered under the Avamar domain /mlab. To export this backup I need to determine its unique identifier (sequence number). Below is the list of backups available for this client. Run this command from the Cloud gateway using the Avamar adminsitrator (MCUser) account. If you want to lock down access substitute this user with an Avamar domain account. 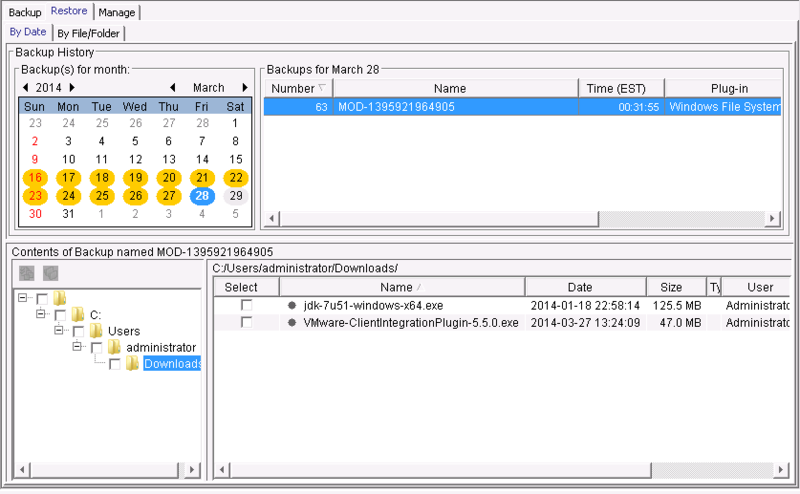 The backup we are interested in is highlighted above with sequence #62 and backup label MOD-1395921964905. To archive we need to export a copy of the backup to the Cloud gateway. Before we do that create an archive directory tree structure on the Cloud gateway that mirrors the Avamar domain structure. This will provide a mapping between archived backups in Glacier and the Avamar domain and client it originated from. If we were archiving backups from multiple Avamar servers then we may choose to prefix the structure with the Avamar server name. This would avoid conflicts. Now we can begin the export process. To do this we instruct Avamar’s avtar command to extract a copy of the backup using the PAX archive format. PAX is short for Portable Archive Exchage and has similarities to tar and cpio. This is written to a file name data.avpax under the directory structure we previously created. From here we can see the exported backup has been created and is now represented by a file on the Cloud gateway. If we look at the exported file it contains some header and XML content followed by the backup data itself. The XML content is used to describe the backup if we ever wanted to bring it back into Avamar. Before we archive this backup we also want to extract file lists and backup job metadata in order to service additional use cases such as a search archive service. For example, a full text search engine could be introduced to index these files to support the process of identifying long term archives for retrieval. There are many free search engines available. One to consider is Elasticsearch. I may get to this in a subsequent blog post. This information is internal to Avamar hence the –internal flag. As this is a Windows file system backup we also want to extract the file list into an ascii file. drwxr-xr-x 2 root root 4096 Mar 27 23:15 .
drwxr-xr-x 3 root root 4096 Mar 27 23:07 .. If we like we can also generate and store a hash of the exported backup so that we can confirm its integrity if we recall it from Glacier. In this case we will use md5sum. As expected mtglacier has identified it needs to upload data.avpax for the archive backup with sequence #62. Now for the real thing. What we see here is mtglacier performed a multipart upload using 4 workers and 16MB chunks. This is necessary to drive parallelism and saturate bandwidth. About 9 minutes later the 181MB file upload completed. Here is what it looked like from the internet gateway. Before we delete the archived backup from Avamar we should take a backup of the metadata we created on the Cloud gateway. This is necessary to ensure we can always maintain the relationship between Avamar archived backups and Glacier archives. We can safely delete the exported backups and the backups they represent in Avamar. First delete the backup in Avamar. At this point we have successfully demonstrated how to archive an Avamar backup to Glacier. Unfortunately mtglacier does not support restoring individual files. Rather, it restores any files referenced in the journal log that do not exist in the local archive file system. To work around this limitation we extract the record entry we want to restore from the journal log and create a new one. We then use the new log to initiate the restore. In this case we want to retrieve the backup that was recently archived for winco.mlab.local with sequence #62. Now initiate the restore request from Glacier using the retrieve.log journal we just created. I waited a few hours and it still wasn’t available. I tried the next morning and the restore completed. Here is what the internet gateway reported. This graph looks significantly higher and narrower than the previous one. Can anyone guess why? My broadband connection is asymmetric. That is, the download line rate is significantly higher than the upload. This is very common for home broadband connections. However, for this use case, it is not ideal. We would generate significantly more upload traffic than download. To make this feasible requires a symmetric link. 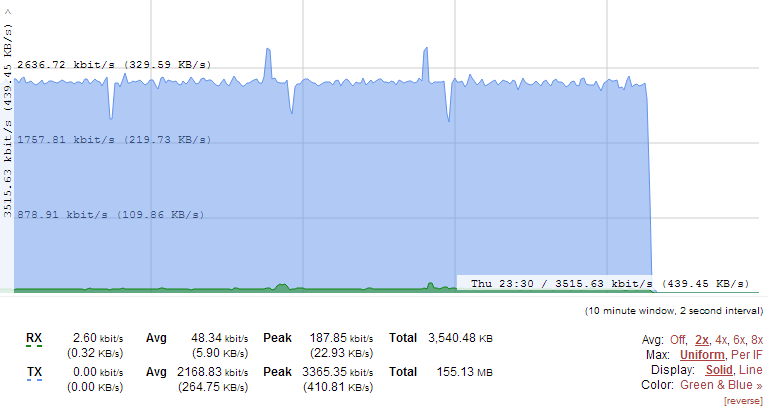 In this experiment the download was quick and ran @ 3 MB/s. My link is capable of 10 MB/s. 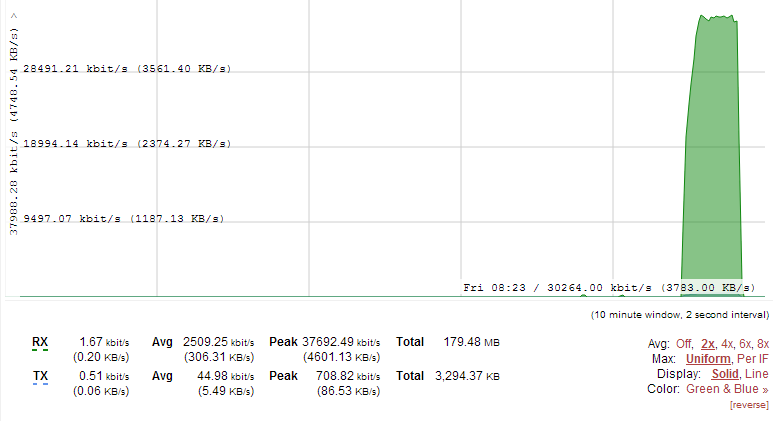 Lets check the download against the MD5 hash we created. Now that we have downloaded the archive we need to import it back into Avamar. In this case we want to import it back into the original Avamar client. We specify the domain path as defined when it was exported. Now lets list the backups to make sure it was imported correctly. We can see a new backup #63 was imported. Avamar did not use the original sequence number. It increments these when backups are created. The imported backup shares the same label as the original backup we exported which is OK.
We can now browse this backup using Avamar Administrator and restore it. We should point out the imported backup has no expiration date. If we want to set this we would use the –expires argument to avtar during the import. What about compression and encryption? If you would prefer to compress and subsequently encrypt the backups before they are sent to Glacier then we can substitute –stream for –to-stdout in the case of exports and –from-stdin in the case of imports. You could use gzip or bzip2 for compression and ccrypt for encryption. Make sure to compress before encrypting. For the encryption key we could use a combination of the Avamar backup label and sequence number. What about alternative archive targets? Although Glacier was used as the target for this experiment, the options are endless. The same approach can be used to archive backups to many popular cloud and object stores including S3, Swift, Atmos, EVault, Azure, Google and Ceph, either through similar tools like mtglacier or alternatives such as FUSE modules. Alternatively if you want to keep your archives on premise then traditional block or file storage systems could be consumed by the Cloud gateway. Ideally, these would implement erasure coding schemes to keep costs down. So it can be done… But is it practical? We have proven it is possible to archive Avamar backups but does that mean it is practical? Lets put things into perspective. If we wanted to archive monthly backups for long term retention to Glacier what would we need? Avamar comes in many flavours; virtual, physical, with and without Data Domain. The sizes range from 500GB (before dedup) to 124TB (Avamar 16 node grid). With Data Domain we can store 570TB in the active tier and have several attached to one Avamar server. Now, lets assume we stopped storing backups in Avamar greater than 1 month old and instead use Glacier. To work out the size of our monthly backup we need to understand the ratio of front-end protected storage to backend consumed for a 30 day retention profile. There are many factors that impact this ratio (data type, change rate, growth rate, etc) however for the purpose of this experiment we will use 1:1. For a 500GB Avamar instance we would need to archive 500GB a month to Glacier. We have 30 days to complete the archive before the next cycle starts. Realistically we don’t want to consume the entire 30 days. We need to give ourselves some tolerance. Therefore, lets say we want to complete a monthly cycle within 50% either side of the next cycle. How much upload bandwidth would we need for 500GB? We would need a 3.2 Mbps upload link. What about larger volumes of data? Below is a table of volumes relative to time occupied between cycles. In the 100% case the archiving process is running 24×7. 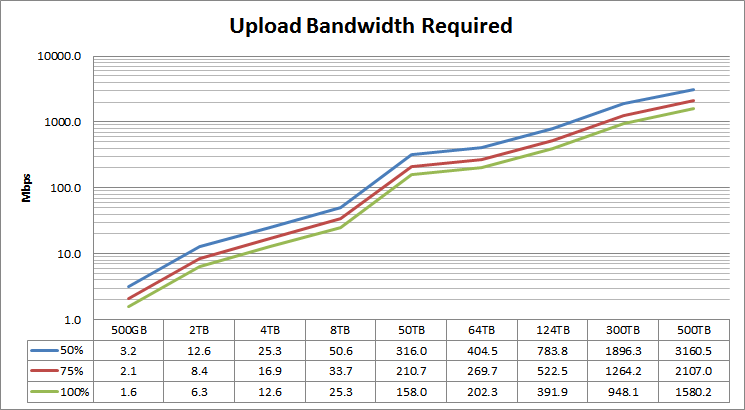 What we can infer from this chart is the upload bandwidth requirements are very high. For example, my broadband can only accommodate 2 Mbps. Even then home broadband plans are not appropriate as most of them have upload GB caps and throttle bandwidth to impractical levels when the cap is reached. My cap is 200 GB for upload and download combined and costs $80 AUD/month. What we need is a symmetric link which is often reserved for businesses. For example, a leading telco offers 10 Mbps business plans. That would support a 2TB monthly archive use case to Glacier at 75% busy. However, this type of connectivity is very costly at $7931/month. Compare this to Glacier’s cost of $0.01/GB/month or in this case $20/month (first month) scaling to $240/month (12 months) to store monthly archived backups for 1 year. In this example, the cost of networking is 33x more than storage. This makes any cloud storage look expensive even at $0.01/GB/month. The blended cost is $0.34/GB/month after year 1 (excluding AWS get/put request and restore costs). Glacier is a very cost effective cold storage service. However, the cost of networking in this country makes it impractical to consume Glacier over the Internet for long term backup archives. To address this issue AWS offers alternative connectivity options that bypass traditional Internet connections and provides direct connectivity. The product is called AWS Direct Connect and is designed to be more cost effective for large scale requirements. However, in addition to AWS Direct Connect usage costs there are line costs associated with AWS Direct Connect network partners. These prices are not in the public domain (that I could find) which makes it difficult to evaluate. 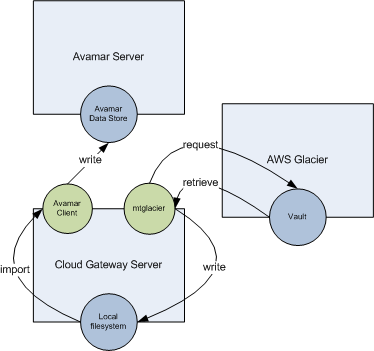 In part 2 we will explore if it is possible to minimise the networking requirements between Avamar and Glacier.